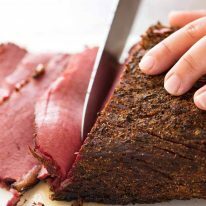 This is an easy homemade Pastrami for all the poor sods like myself who don’t live around the corner from a New York Jewish deli. Tender, juicy and with the signature pastrami spice crust, this is astonishingly straight forward to make. Use it to make giant pastrami sandwiches on rye, or Reuben sandwiches! If Katz’s isn’t my first stop when I land in New York, it’s my second or third stop – and probably only because I had a prior dinner commitment. Yes, I’m that obsessed with pastrami sandwiches. Let’s be clear about one thing here – this is not a pastrami sandwich as many people know them here in Australia. 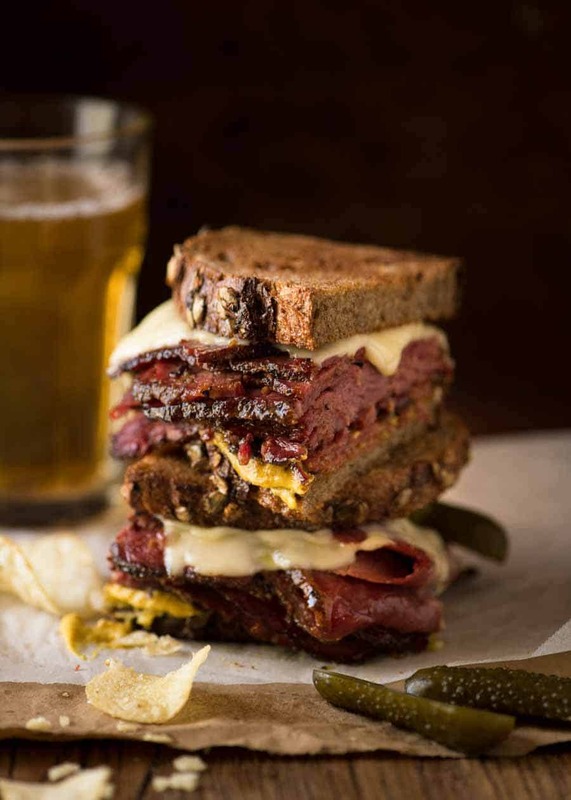 The pastrami piled high in these sandwiches are light years away from the cold, slippery cuts we get over the counter at delis. 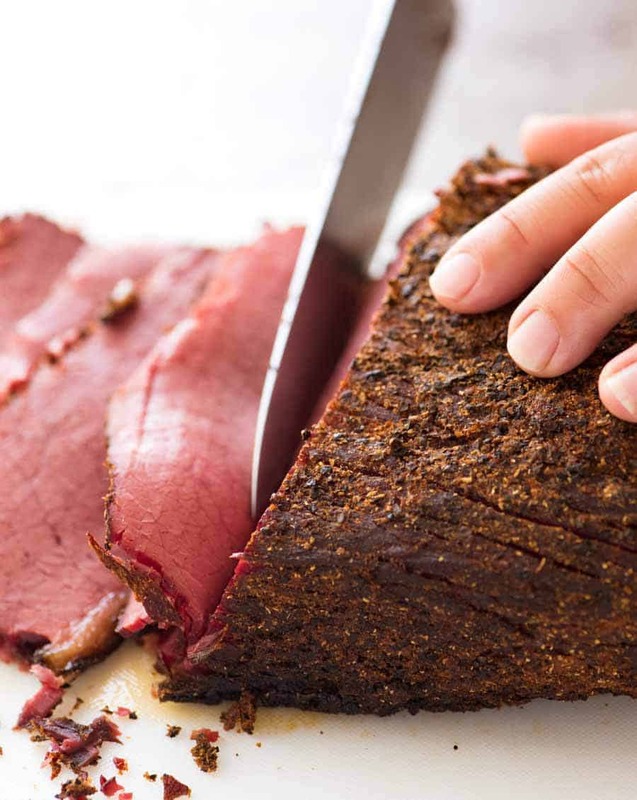 The pastrami you get at Jewish delis in the States is tender, juicy, fall apart and loaded with that wonderful earthy spice flavours of the pastrami crust with the obligatory black pepper kick. I have searched high and low, but the sad fact is that there is simply nowhere in Sydney that has pastrami that is anywhere near Katz’s. So I decided to take matters into my own hands and make my own pastrami. Real pastrami is smoked for days. Days, my friends. I’ve read that the Katz’s smoker is the size of an apartment. Pastrami is serious business! 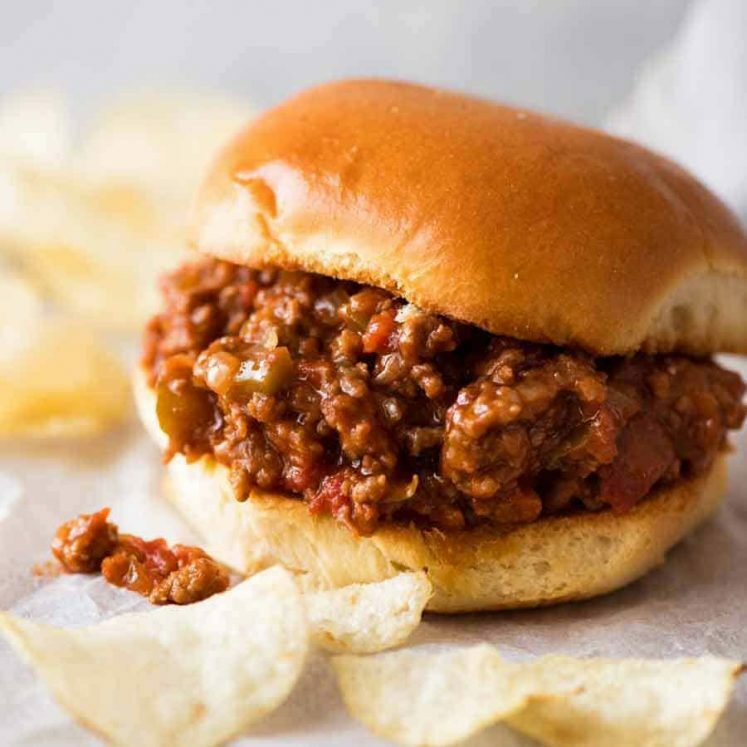 Mine is a somewhat more achievable home version – made in the slow cooker or pressure cooker. Slow cook or pressure cook until tender. Cool for ease of slicing before baking briefly just to seal the crust, then slice thinly, and pile high on rye bread. 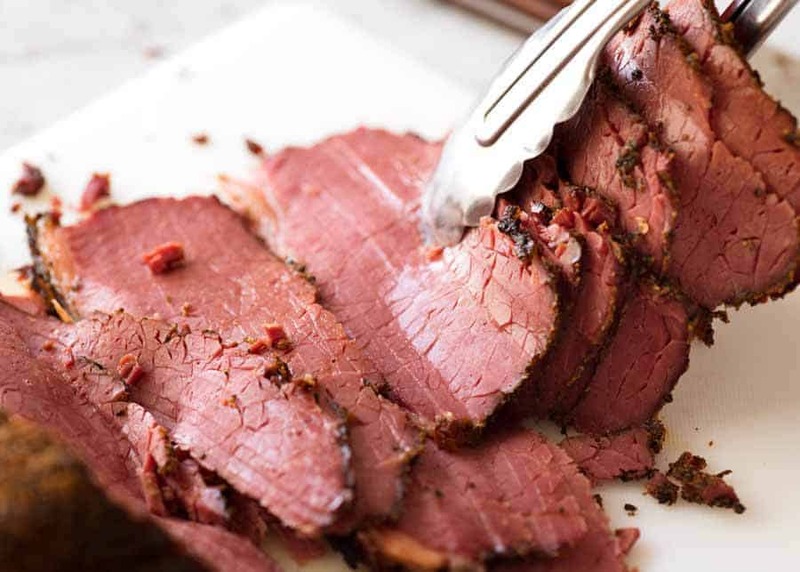 * Corned Beef is beef that’s been brined, either brisket or silverside beef cuts. An economical cut sold in the fresh meat section of supermarkets. It’s called Salt Beef or Pickled Salt Beef in the UK. Is it as good as Katz’s? No. And no homemade version ever will be. PS If you’d like to try your hand at a real pastrami made in a smoker, I recommend this one from my friend Kevin at Kevin is Cooking. Lightly toasted dark rye bread slathered with butter then mustard then piled high with lots of thinly sliced homemade pastrami. 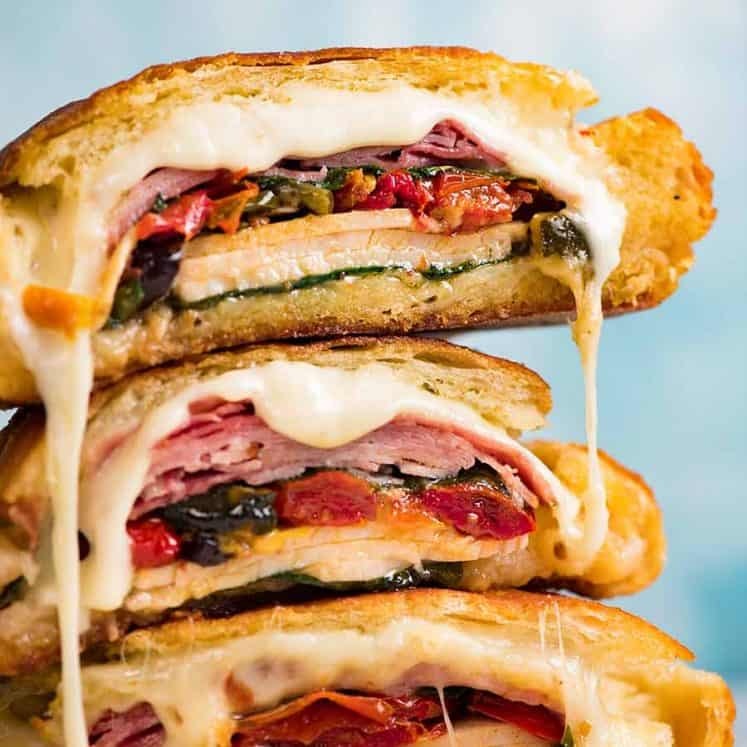 Melted cheese is optional (mandatory in my books!). Recipe video above. 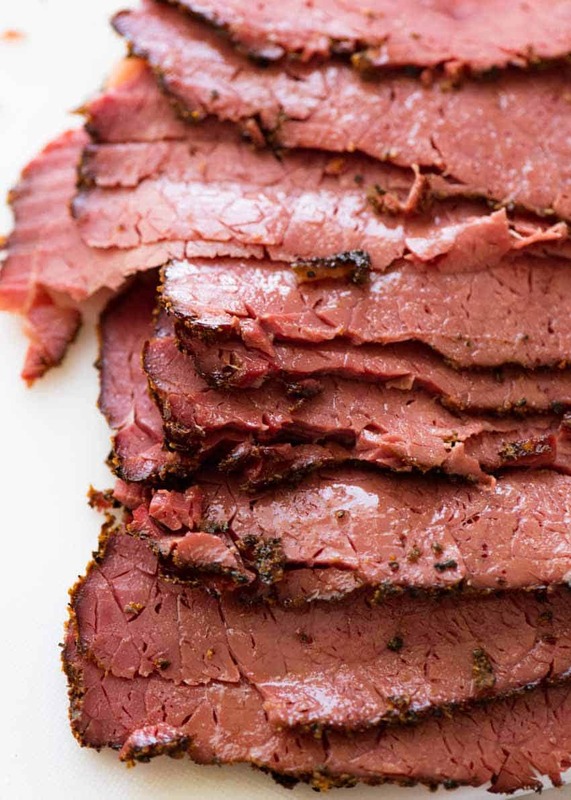 Homemade, warm, tender pastrami is an utter delight. 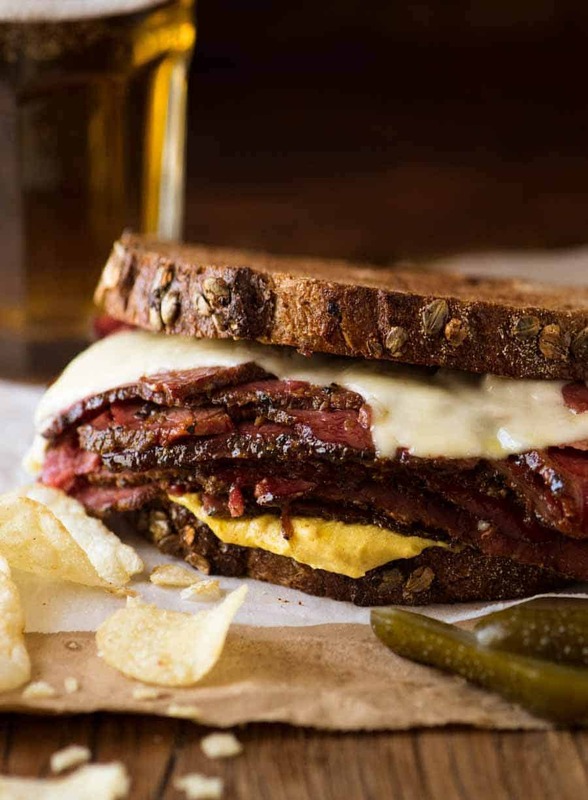 It's not as good as Katz's deli in New York, but it's way better than those cold cuts you get at standard delis and will go a long way to curb your pastrami cravings! Mix Spice Mix and spread out on a tray. Pat beef dry then roll in Spice Mix, coating well all over. Sprinkle with liquid smoke it using (I rarely use this). Place beef fat cap side down and wrap in a large sheet of foil. Repeat again with another sheet of foil and flip the beef so the fat cap is on the top. Place rack in slow cooker (Note 2), place beef on rack. Slow cook for 10 hours on low or electric pressure cook for 1 hour 40 minutes (see notes for oven). Remove beef, cool then refrigerate for 6 hours +. Reserve juices in slow cooker. Unwrap beef. Place rack on tray, place beef on rack. Bake 30 minutes at 180C/350F until spice crust is set. Remove from oven, slice thinly - pastrami will be tender. Place some pastrami in a dish, spoon over a bit of reserved juices. Cover and microwave to warm (I like to add a slice of Swiss cheese). Pile high on toasted rye bread slathered with plenty of mustard of choice. Serve with pickles on the side. 1. Because this is an easy Pastrami recipe, I start with a store bought corned beef. This is beef that's been brined and is sold vac packed, and it's an economical cut. 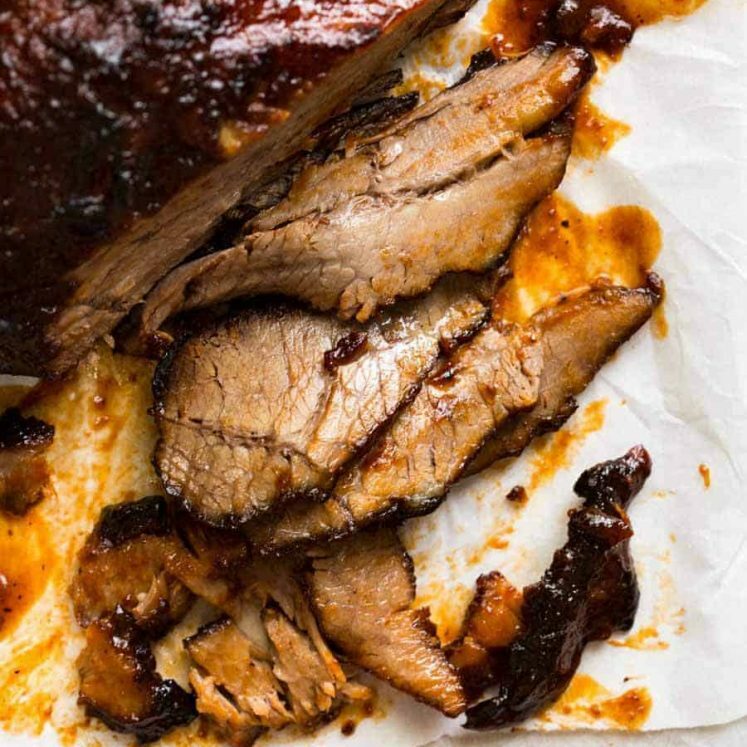 Note for UK: The corned beef used in this recipe is called Salt Beef or Pickled Beef in the UK. In the UK, corned beef is like beef SPAM sold in cans. Do not use that in this recipe! Electric Pressure Cooker -you don't need to add liquid because corned beef is plump with extra liquid it has absorbed from the brining process so it drops liquid as it heats up, and it's that liquid that creates the steam that creates the pressure cooking environment. If for some reason it doesn't come to temperature (ie that whistling noise never occurs, pop in 1/2 cup of water - but I've never had to do this). You end up with the same amount of liquid at the bottom of the pot whether you slow cook or pressure cook. Stove top pressure cooker: add 1/2 cup of water. 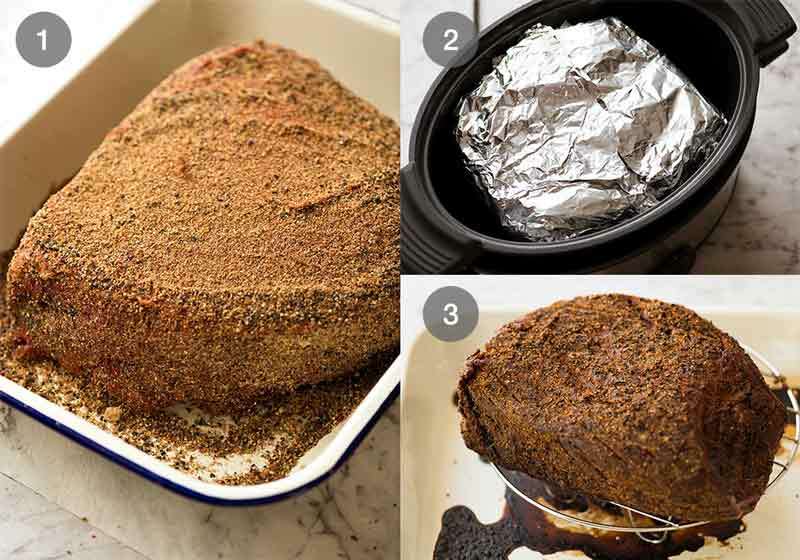 Oven - I haven’t tried this myself, but this is what I would do: wrap with foil one extra time, add 1/2 cup water in pan, put wrapped beef on rack in pan, cover pan tightly with foil. Recipe I reference (see below) says 110C/225F for 6 hours which sounds about right compared for the slow cooking time I use. 4. General notes: The slow cooking part tenderising the meat and allows the spice flavours to infuse. The cooling in the fridge makes it easier to slice thinly - if you try to slice hot corned beef, it crumbles. The baking seals the crust - it doesn't heat through, you want the centre cold for easier slicing. 5. SERVINGS: The corned beef will shrink by about 30%, so 2kg/4lb yields about 1.4kg/2.8lb cooked meat. Allow 300 g / 10 oz per serving for large pastrami sandwiches, as pictured. 6. Recipe loosely guided by this Allrecipes.com pastrami recipe. 7. Store leftovers for up to 5 days in the refrigerator. Reheat slices per recipe. Originally published May 2014, recipe updated June 2018 with a more streamlined, better recipe. Great, easy recipe! Made fantastic sandwiches. I’m so glad you think so Jack! Another keeper recipe! Unexpected happenings caused the corned beef to languish in the fridge for a couple of days, after its 10 hours in the slow cooker. Today, I did the oven baking, and sliced the meat for sandwiches. The original four pounds had shrunk, a lot! Happily, a lot of fat had rendered off in the process. The flavor was spot-on, for pastrami. I’d have to cut back on pepper, so that the littles’ heads don’t explode … or, I could throw in a chicken breast for their sandwiches! So very good. Thanks! This was easy and delicious! Thank you for this recipe! Third time making this (in the oven) terrific! Don’t see how to add a pic ’cause I would. 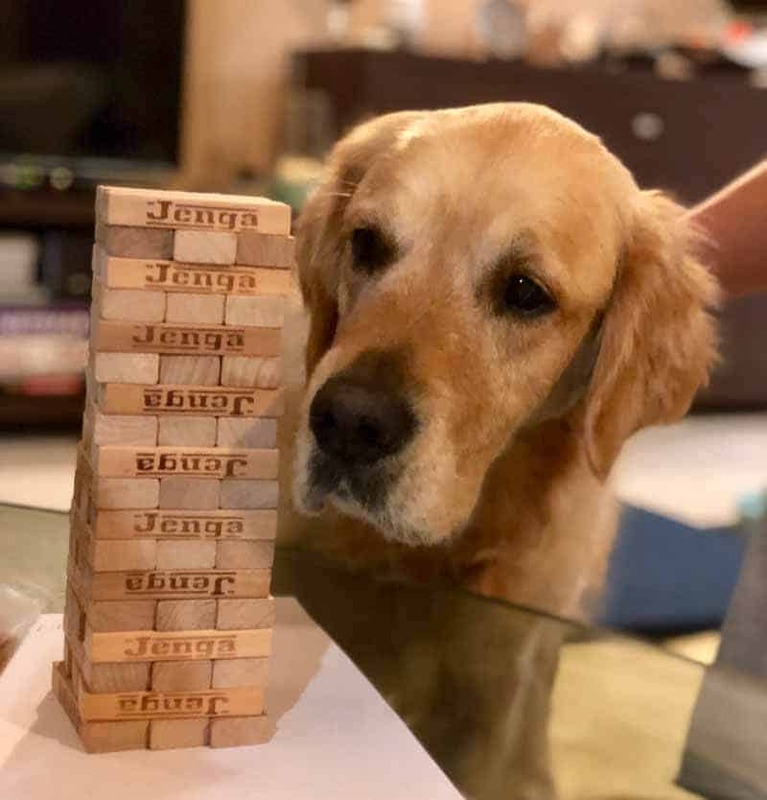 I’m so glad you love it Jim! Hi Nagi, am I able to use girello for this recipe? Hi Sharon, I haven’t tried to be honest, can you buy corned girello? Question: do u use the spice packet that comes with corned beef? Thank you. Hi Lori, our corned beef here doesn’t come with any spice packets – leave it out. I hope you love it!! Made this by oven method exactly as suggested. Turned out so well with a great flavor. Really smelled great while cooking, which is usually not the case with corned beef! Next March when the cryovacs of corned beef are on sale for St. Patrick’s Day I will put several in the freezer especially for this recipe. Absolute delicious! I was a little confused about using an Instant Pot, I thought your directions said that water was not needed because of the liquid that cooks off the corned beef. I did add 1 1/2 c of water to my IP Ultra. The results are amazing! Thanks for such a great recipe. I’m so glad it worked for you Farrel! This looks amazing!! Does it need to be wrapped if in foil if cooking in an electric pressure cooker?